The library is a meeting place where social zones require a cosier light setting. 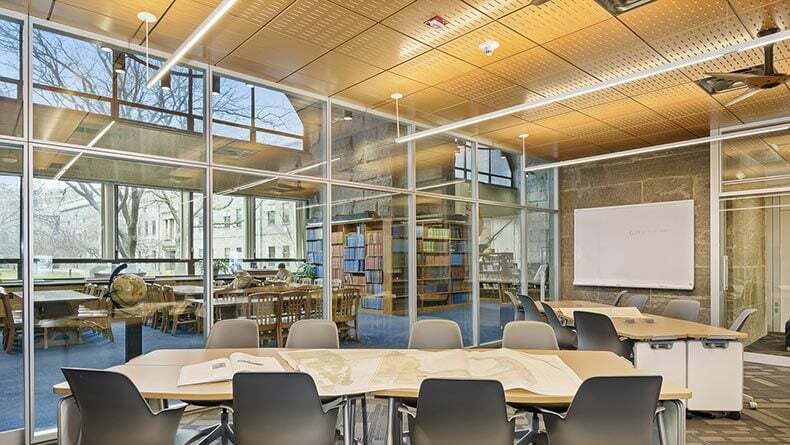 RUSH UP/DN Luminaire creates a friendly and comfortable atmosphere for reading and working at SUNY Library . Landow & Landow developed a masterplan for updating and remodeling the College’s main campus library and museum in the historic Fort Schuyler. The upgrades to the existing spaces incorporate technology, create flexible spaces, and develop a 21st century college library designed to blend the new features with the ambiance of this classic building. The first phase of the upgrades, which included the creation of two classrooms with smaller connected breakout rooms in between, has been completed.